keyboards are still a major source of data input. flat screen like a smart phone or a tablet. a direct link between your brain and the computer. Today we will practice typing - typing as fast as possible. Yes - 45 minutes of typing practice. Be sure to take a test at least once. You can start with a picture of yourself. If you prefer, use a picture from Google images. SOMEONE ELSE in the school. Use one of these services, or a different service if you wish, to make a funny photo. and must NOT be offensive. Make something interesting that we can PRINT and post on the BULLETIN BOARD in 276. Use the Atrium-Color printer. Write your name on the printed picture before posting it. Your task today is to make your own business cards. separate cards. Give one card to the teacher. your pictures with a business card. Choose appropriate software for these tasks. Please spend one more day investigating Ubuntu Linux. Be sure to spend some time investigating the Educational software. We will discuss this in class tomorrow. We will investigate Ubuntu Linux, by using it on the PCs in our classroom. especially from 5:20 to 13:20. Make a game - make several games. If it's not fun, you're doing something wrong. and classes from your program. then creates a web-page that will display the applet. 3. Publish your program onto the official Greenfoot web-site. before you can do this. Try each of these options with your puzzle program. Find out how to make each option function successfully. levels, so the window size is big enough for the whole program. "figure out" how to solve it. You may use the tool you find most productive - processing or HTML or Greenfoot. Whichever tool you choose, stick to using techniques that you understand. The puzzles should use graphics to make the appearance interesting. There must be some animation to keep things exciting. The puzzles should be interactive - the use can click on things or move things around using the keyboard. where you click keys as fast as possible. Your program/pages should proceed automatically from one puzzle to the next. - Unscramble "wtasuohrcpraerdmbled" (words that are scrambled up). - Solve a math problem and guide a moving player to the right answer. - Move a player to collect objects in the right order to solve a problem. Those are just examples - many other things are possible. But these are PUZZLES, not games or movies. puzzles must exercise the user's brain. way up to something more complicated. This assignment is due on Friday 24 May. You will be writing a program in Greenfoot as your final year-end project. You may need a few more skills for this task. - Find out how to make a mouse-rollover that changes the color of some text. - Find out how to make sound effects. - Find out how to make objects bounce off of each other when they collide. turn at the corners of the screen? (2) What commands are used to detect and respond to a mouse click? (3) What commands are used to respond to keyboard keys? (4) What commands are used to detect a collision between 2 objects? (4) Make a PYRAMID cube. Start simple, that make it better. Need a picture? Search in Google for PYRAMID IMAGES. to make turtle subclasses to draw specific figures. (1) Type this code in to create a SquareDot turtle. 8 SquareDot objects, one below the other. draw a row of 8 squares and dots. that will make the optical illusion more effective. instead of a white circle, and FILLS IN the white square. (5) Try making the SquareDot squares bitter, to creat a good optical illusion. Make thicker lines by drawing lots of lines next to each other. By drawing lots of lines, fill in an entire square. Then make a 4x4 grid of 16 small squares. Download this starting project and open it in Greenfoot. so that all 3 Triangle objects will stay on the page. so that it draws a Hexagon divided into 6 Triangles. (3) Right click on [Turtle] and choose [New subclass]. to ensure that the Square object does indeed draw a square. (5) Open [TurtleWorld] and find the prepare() method. to place 9 squares in a 3x3 grid, making one big square. All the pairs of students have finished ads - so we have 10 ads total. Now we need to combine these ads together into a single web-page. - Be sure that the AUTHORS' NAMES appear somewhere inside each page. and send an email to the teacher with the .zip file attached. Be sure that all the images are included in the .zip file. make these available to the entire class. move an ad into a new web-page. - Collect all ads into a well organized, understandable, single web-page. all 10 single ad pages plus the big web-page containing all 10 ads. - On Friday we will discuss the difficulties associated with this group work. Bring it to class tomorrow. so that we can put all the ads together during class. We will make "banner ads" for school events. You must work with a partner - groups of TWO students. The ad should be interesting, attractive and informative. You may use images downloaded from Google images or any other source. Each programming pair must produce ONE advertisement. For more ideas, try reading these notes. After the break we will make animated ads for school activities. Start by reading these notes and trying out the various fading and zooming commands. Click here to start your quiz. Continue practicing with Slide and setTimeout commands. Get an image of a map for a city that you know. to each location, similar to the Animated Map above. when a label or image is clicked. Do the exercises involving setTimeout(). to fix a web-page under timed conditions. You can use notes (including web-sites) during the quiz. Create the web-page described in the notes. Look at these sample pages. these only in Internet Explorer. Try out this Drag & Drop Math page. Add drop-boxes next to your math problems. Change the checking() method to correctly check all 5 problems. You need to turn in your interactive quiz. This may not be as simple as you hoped. interactions in web-pages. Here is the first example demonstrating Drag-And-Drop. Next week we will use BlueGriffon to create web-pages. Make sure you download this before Monday 4 March. You will write a quiz web-site, with many pages. Type this web-page into your editor (Kompozer). to open the second page after the first answer is correct. Show your program to the teacher when you have finished. This version of the Grinch Animation can start and stop. are pre-loaded into invisible image tags. to your DropBox account, into a new folder. and any notes you wish - printed or on the computer. Look at this sample web page. It probably won't work correctly due to bandwidth issues. You can download this .zip archive and run it locally. so that the animation can run from a web-site. Make sure the animation runs sensibly. Add a SECOND COPY of the same animation, next to the first one. It needs it's own START button. and make the buttons all work correctly. You will need to upload some web-pages to a Web server. You can use DROPBOX for this purpose, so you will need an account. Make sure you have a DROPBOX account before class tomorrow. We will spend one more day practicing writing slide-show animations the hard way. Actually, this is the simple way, but it produces lots of code. It's possible to achieve the same thing with much less code, but that's TRICKY. We will start learning that next time. You can make your own animated Sprites. You could draw them, but that is an awful lot of work. A better idea is to find Animated GIF files on Google images. Then extract the single frames using the tool at http://gifninja.com/split-animated-gif/new . Then you need to add them to the SAME FOLDER where you save your WEB PAGE. You can find lots of GIF animations at : http://www.animatedgif.net/. Or search in Google Images. Now add a [Stop] button for your slideshow. of whether the show is running or stopping. press [Stop], and only reappear when you press [Start]. Start by making 1 slideshow work. Then add a second one, then the third. Is there a maximum speed (minimum timeout delay) that works properly? the best way to accomplish this. it should not show all the pictures in the entire page. Put at least 5 pictures in each stack. reuse the same function for several slide shows. 3. Bring your slide-show page to the next class on Thursday. Use a camera to take 10 pictures around the school (or at home if you prefer). These must be pictures that you can share with someone else - nothing private. photos that someone else brings to class. For this to work properly, you can put it in the LIME method. But then you will need a separate LIME method for each DIV. it disappears too, and they see the next question. Try this multiple-choice quiz page. Then make the changes listed below. Move the DIV that is on top so that it is next to the other question. Add two more questions of your own - one with bullets, one with DIVs. with the boxes just touching each other. Make all 4 boxes have different colors, including different borders. to change the fonts. Don't use <font> tags. Try out various other style commands, looking for interesting effects. You might want to use this Style Reference Page. or try out more different style commands. After you finish your test, turn in the printed page. you need to do this reading BEFORE Monday. until you reach the [Color Samples] page. and they cannot all have the same names. Read these notes about using DIV boxes to make a Windows 8 Style interface. You may use the computer and your notes to help. Read these notes and make a web-page with clickable pictures. Make a web-page with clickable pictures, with a joke on each picture. Do as many as you can today - practice to get faster and remember more. Browser - Firefox - this will give you them most reliable and functional run-time environment. 2. When is the game over, and who won? Here are some example if.. commands - you will need more. will execute at an appropriate time, like after each move. Kings version 2 - this is the semi-finished Kings game. Now we will make a Tic-Tac-Toe game for 2 players. first click on an X or O, and then click on a square. Clicking on X "chooses" the picture that will be used. Then clicking on the square must place that picture. as zero represents an empty square. Get that much finished before tomorrow. and checking whether there is a winner. We will start this topic by investigating a game called KINGS. normal DRAW loop that is running continuously. through the use of VARIABLES storing VALUES and STATES. You hold the mouse over each picture and it starts "spinning". Move the mouse away to stop spinning. The goal is to get 3 green pictures. The "spinning" pictures should all be spinning when the program starts. you should use mouse-click to stop them from spinning. After a spinner has been clicked, it should not start spinning again. spinning again, so you could have a second try. you will have a programming quiz on Tuesday, 20 Nov.
and a list of required changes that you must make. doing with the spinning pictures. We can use mouse control of flickering slide-shows to make a game. Read these notes about the Flicker Game. Read these notes and make a simple slide-show before class next Tuesday. and what they discovered about how to change the programs. choose the next topic to study. 2. Homework - In Processing, look at various EXAMPLES (in the Files menu). Search for an interesting graphics effect. Be prepared to identify your interesting example on Monday during class. Today: Practice making quiz questions. with questions about the quiz program you have been writing. It will be a short quiz, maybe 25 minutes. Next Week : a new topic and new techniques. See the paper distributed in class. Now make your own quiz. each with a picture and some text. and each box must have an OUTPUT command. Finish this BEFORE MONDAY at the beginning of class. quiz with you, it will be difficult to continue. How can we make more than one question? We will make an example that uses one picture for an entire question. Start with this program - you will also need a couple pictures with questions. 3. When the user clicks on a "wrong" picture, the picture should disappear. When they click on the "right" picture, the program should end. What is world's most popular fruit? Your assignment is to make a multiple choice quiz. But we will write our program in Java, using processing. Start by thinking of 5 questions. Write them on a sheet of paper, together with the correct answers. Collect all the pictures for your answers. If you can't find appropriate pictures, you may need to change a question. You also need green and red check-marks for marking correct/incorrect answers. Friday is the absolute last day in class to work on your video game. that means sometime on Sunday at the latest. to email a zip archive. Be sure that your game is keeping score somehow. put instructions on the screen at the beginning. At least 2 of your characters should be animated. due on Friday at the beginning of class. Continue building your video game. Class is cancelled Wednesday for ISA testing. the library and work independently on Wednesday, Pd 3. On Thursday Pd 5, all students come to class as usual. Create a video game by using the Sprite library and changing/improving the CookieMonster. animated (or still) Sprites. Make them move in interesting and challenging directions. to reach a particular object, kill all the enemies, collect enough points, etc. work okay as long as the players don't hold down the keys for long periods of time. You can use ideas from existing games, like Frogger, Pacman, Space Invaders, etc. Don't try to make a 3D game - you don't have enough programming skills yet. do some work at home. You can decide how to organize your time. You can make your own animated Sprites. You could draw them, but that is an awful lot of work. Then you need to add them to the Sketch folder in the DATA sub-folder. Read the notes in Cookie Monster Sprites . ANIMATED sprite to the CookieMonster program. a picture in Google Images and save a copy on your hard-disk. You probably want a small image. Then search for your file and add it. at the end of class on Monday 17 Sep. Create a "screen-saver" animation program. This should have lots of "sprites" moving around in various directions. disappears after 5 seconds, or a new sprite appears after 10 seconds. side-by-side, or a stupid little turtle moving very slowly in the middle, etc. it's too big and too complicated. Keep your sprites simple. Make at least one of the sprites change colors occasionally. 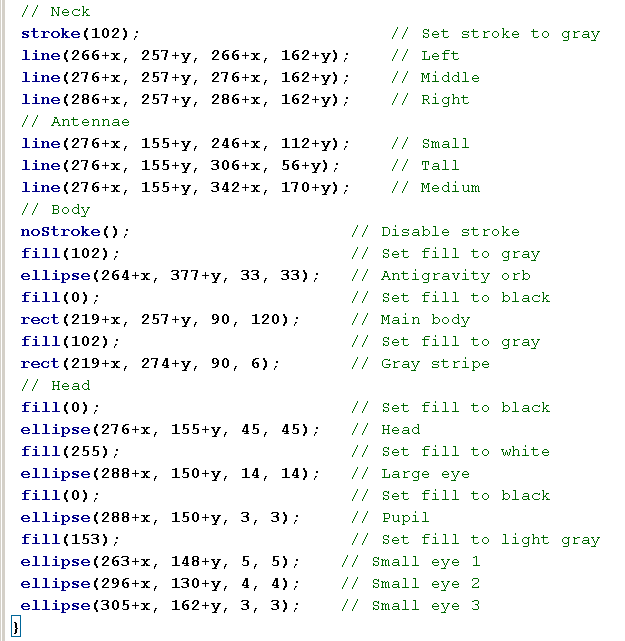 Here is a sample program, just so you see the basic commands. Here is the original robot program. Finish the 4 Robots program, with 4 robots moving in 4 directions. (no, you cannot copy and paste). 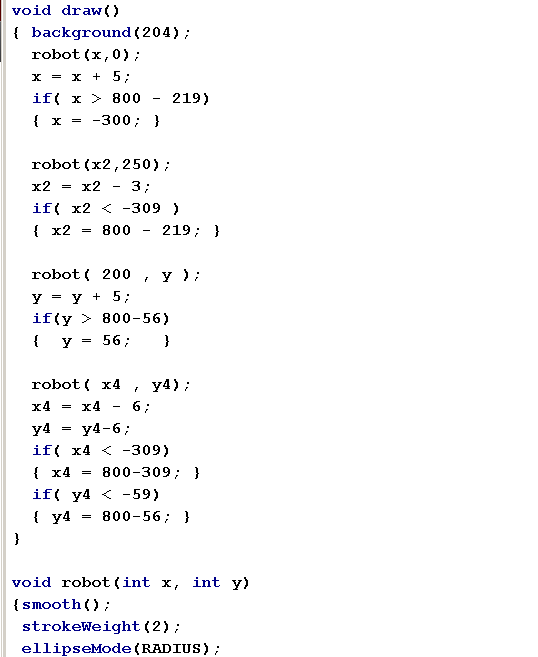 Homework : Type the Robot program from the hand-out. Bring the program with you to class tomorrow. You may need a clear set of steps for creating methods for letters. The teacher will demonstrate how to follow these steps. We can use a method to draw any shape we wish. This is especially interesting if we need many copies of the shape. you will need some parameters that move letters to other locations. It's also nice to include color parameters. Here are some more extensive notes on this topic. The second page is more important - the first page is an introduction. We will have a test on Monday 10 Sep.
use anything you have written before. to accomplish in 45 minutes. so we can make a set of faces like the Andy Warhol poster. Write a program to draw the required picture. The flags project only drew straight lines and rectangles. We also need curves sometimes. Click here for notes about drawing circles and arcs. TEST - plan on a test on Friday 24 August. and a practical programming section, where you must write a program. This test will be open book, as most tests in this class. that you have saved in your computer. Too bad if you don't have any notes. We will be using Processing to write programs that create graphics displays. We will start with a program that draws flags. The teacher will show how to draw lines and rectangles in Processing. Read these notes and get started drawing some flags. How is that connected to our Graphics Programming class? We will discuss this sometime in the future.